When the United States entered World War II in December 1941, young and old from across America rose to the challenge and did what they could to serve their country. Sentiment was no different in Bozeman, where groups of Red Cross volunteers rolled bandages, residents saved ration stamps, and young men and women enlisted in all branches of the military. One local family contributed to the war effort in unique ways, their patriotism shining on both the local and national levels. Emil and Alice Dahl moved to Bozeman in the late 1930s, after purchasing a local mortuary. A blacksmith by trade, Emil became a licensed funeral director after studying at Worsham College in Illinois. Prior to her marriage to Emil in 1917, Alice Kane Dahl studied nursing and worked as a registered nurse. Once in Bozeman, the Dahls threw their energy into operating the family business, Dahl Funeral Chapel. 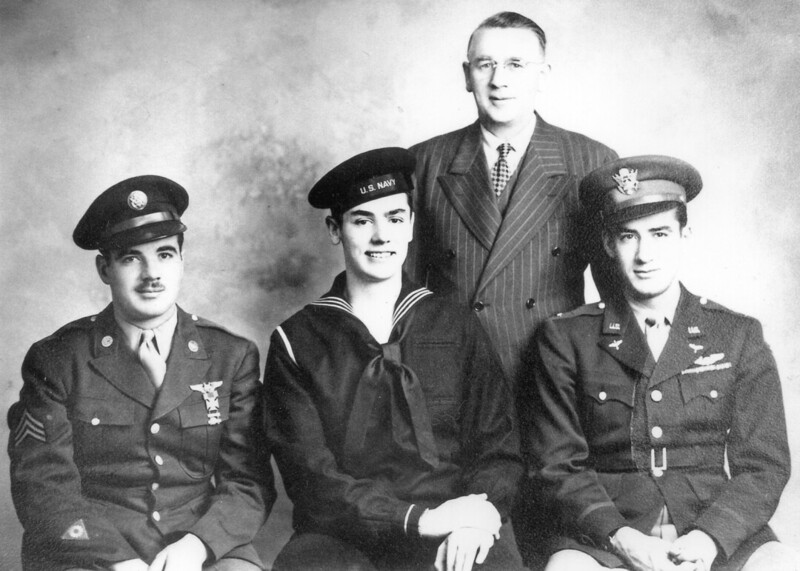 Emil and Alice’s oldest son, Eldon, joined the U.S. Army Air Corps in 1942. A decorated pilot, Eldon flew missions in Europe and North Africa. On August 25, 1943, during his 41st combat mission, Eldon’s B-17 was shot down over Italy and he was reported missing in action. His family feared the worst. Fortunately, Eldon bailed out before his plane crashed, but he was captured by Italian and German forces and spent nearly three months as a prisoner of war before he escaped and eventually reached the American front lines. Staff Sergeant Charles Raymond Dahl followed in his brother’s footsteps and enlisted with the Army Air Corps in 1942. Raymond served as a bombardier and nose gunner in a B-24 over Europe. Sadly, Raymond was killed in action over Germany when his plane was shot down on May 29, 1944. In 1943, Emil and Alice’s second oldest daughter, Mary, graduated in the top ten from her class of 2,500 at Montana State College. She completed an internship in dietetics from Stanford University Hospital, then joined the Army Medical Corps in 1944 as a Second Lieutenant. After training in Oregon, Texas, and in Hawaii, Mary boarded a ship bound for the South Pacific. She spent three months at a hospital on Guam before being transferred to Iwo Jima. As a dietician, Mary’s job was to oversee menus, food preparation, and meal serving for American servicemen. Mary, who was promoted to first Lieutenant in 1945, related some of her experiences on Iwo Jima in a chapter entitled “It Was the Patriotic Thing to Do: From Montana to Iwo Jima,” in the book Women of the Homefront: World War II Recollections of 55 Americans, edited by Pauline Parker (2002 by McFarland & Company, Inc., Publishers). Her fascinating account of daily life on the island (including a nighttime air raid) offers a unique perspective on women’s wartime experiences. Emil and Alice’s other two children, Vera Dahl Jensen and John Bernard Dahl, also contributed to the war effort. Vera, a registered nurse like her mother, worked in Washington training nurse aides. She also cared for patients of Japanese descent—American citizens that were bound for internment camps. John, or Bernard as he was called, enlisted and became an officer in the U.S. Navy. Like her children, Alice Dahl also received wartime accolades. 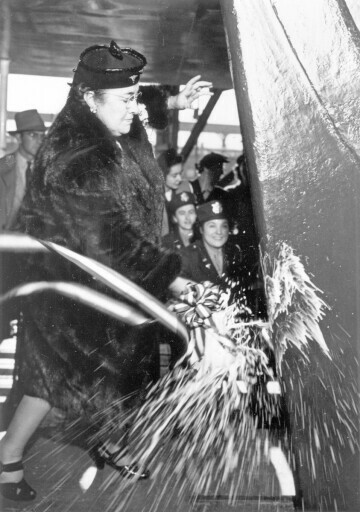 As a gold star parent (those who had lost sons or daughters in military service during the war), Alice Dahl received the great honor of christening a “Victory” ship in 1944. “Victory” ships were mass-produced cargo ships, designed to more efficiently dodge, outrun, and withstand attacks from U-boats. On November 17, 1944, the Bozeman Courier printed an article titled “Mrs. 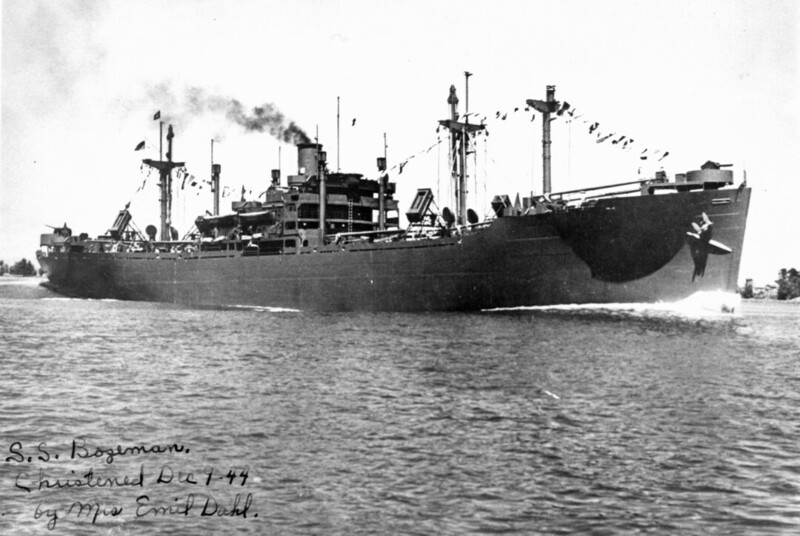 Emil Dahl to Christen S. S. Bozeman in Portland,” which related the reasoning behind the ship’s moniker. “These victory ships are being named one for each of two towns in each state of the union, towns with historical backgrounds. The commission considers it quite a signal honor that Bozeman is to be one of the two towns chosen in Montana.” Many years later, Alice told a reporter that she believed the name Bozeman was simply chosen out of a hat filled with names of Montana towns. According to an interview with Alice Dahl in a 1983 article in the Bozeman Daily Chronicle titled “Mrs. Dahl sent S.S. Bozeman off to fight war,” she believed the ship was later sold to a buyer from South America. Internet research (from shipbuildinghistory.com) suggests that the S.S. Bozeman Victory was sold to a private party in 1946 and later scrapped. The ship was in service a total of only 106 days. After the war, the Dahl family returned to their family business in Bozeman. Eldon ran the Dahl Funeral Chapel for decades, and the business remains in the family today. He was an active member of the Air Force reserve until he retired as a Lt. Colonel in 1978. Charles Raymond Dahl was originally buried in a village cemetery in Kirch Mulsow, Germany in 1944. His body was reinterred in Bozeman’s Sunset Hills Cemetery in May, 1949. Mary Dahl Jorgensen lived a full life with her family in California. She passed away in 2002 at age 80. Like her mother, Vera Dahl Jensen enjoyed an exemplary nursing career, retiring at age 72. John Bernard also worked in the funeral business and eventually established the Dahl Funeral Chapel in Billings in the mid-1950s. Emil passed away in 1980, followed by his wife Alice six years later. The Alice Kane Dahl Nursing Scholarship was established at Montana State University following her death, in recognition of her inspiring work in the nursing field, which motivated many other young women to follow in her footsteps.